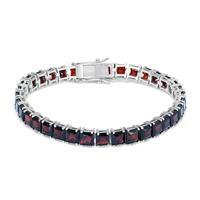 An adjustable infinity bolo bracelet set with genuine diamonds and a heart shape garnet center gemstone. 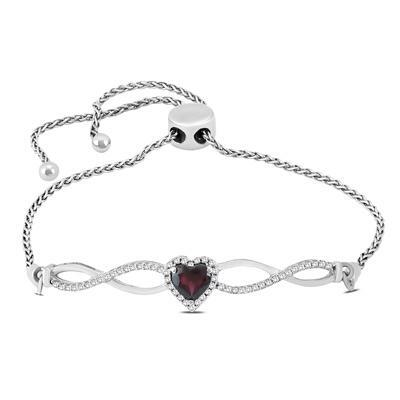 The bracelet is crafted in .925 sterling silver. 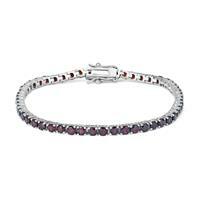 A stylish adjustable bolo bracelet featuring an exquisite gemstone and diamond infinity design sure to be treasured forever. 55 prong set diamonds weigh 1/4 carat total weight and the center gemstone measures 5mm in diameter. All Promotional & Daily Deal items are shipped in a light weight cardboard box with foam inserts that securely hold your Jewelry. We understand how important it is for you to receive your jewelry purchase promptly and safely. At Szul, our priority is to serve your needs in the manner you request. Please be sure to review the shipping & processing time listed on your particular product. The processing time of your product is listed directly under product specification beneath the "USA Flag logo" button on your jewelry item's information page. Choosing an Express or expedited shipping method does not mean that the processing and manufacturing time on your product will be faster. Please also keep in mind that "Business Days" do not include weekends or holidays. Szul offers the following shipping options for every purchase. For your protection, all shipments are insured for their full list price. *Please note that any additional customs or import duties must be paid for by the recipient. Please note that orders received after 3:00 PM EST will be processed the following business day. While determining the arrival day of your purchase, count business days only. The first shipping day will be the day after your order is processed. International, PO Box, or APO Military Shipping Service is not available on certified loose diamond purchases made with a Credit Card. Bank Wire Transfer Payment is required for all certified loose diamond orders destined for an International, PO BOX, or APO Military address. All certified loose diamond orders purchased with a credit card must be shipped to a physical address within the United States. We work closely with our shipping partners to ensure timely delivery of your purchases. However, Szul is not responsible for any weather related delays that may occur after your order is shipped. We apologize for any delays that may occur while in transit and our customer service department will work closely with you to re-route any packages that may be affected. If you have made an alterations request for your purchase -- such as ring or bracelet sizing -- please allow 5 business days to process your special requests. If you have any further questions or concerns regarding our policies, please contact us at customerservice@szul.com. 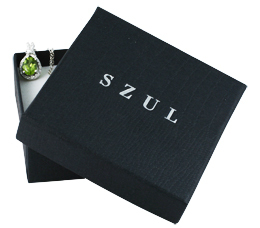 Szul wants to make your online purchase of jewelry a convenient and hassle-free experience. We currently accept an array of payment mechanisms, and soon we plan to extend other payment acceptance services. Please be assured that our online payment acceptance mechanisms are safe and secure. All of your information is kept strictly confidential and is not shared with any outside agencies. You may review our user information privacy and transaction security policies. We gladly accept VISA, MasterCard, American Express, and Discover for credit card payments. Szul accepts money order, all money orders must be payable in US dollars.Your order will be shipped once your money order is received. Customers can use Gift Certificates for purchases on Szul.com. Gift Certificates issued directly from Szul can be used to purchase any item available on Szul.com. Please visit the following link to purchase a Gift Certificate. *Discounted or Promotional Gift Certificates (inclusive of Gift Certificates issued by a third party) are not valid for use on Certified Loose Diamond purchases. Should you have any further questions or concerns regarding our payment options, please feel free to contact us at customerservice@szul.com. All Pricing is subject to change. For all Prices, Products, Product Details and Offers, Szul.com reserves the right to make adjustments due to market conditions, manufacturing price changes, product discontinuation, errors in advertising and any other extenuating circumstance. Szul.com makes every effort to provide the most up-to-date and accurate pricing and product information. Despite best efforts, incorrect pricing or product detail listing may occur. In the event a product is listed at an incorrect price or lists incorrect product details due to technical, typographical, photographic or supplier error, Szul.com reserves the right to refuse or cancel and fully refund any order placed. Products marked with a Closeout or a Clearance Price cannot be combined with any other promotion. To increase the convenience of your shopping experience, we offer various options for you to make purchase orders. Completed order forms should be faxed to 212-689-7771. Please have item number(s), billing information (including credit card type and number), and shipping information ready. If you are not completely satisfied with your purchase, we will be happy to refund, replace, or exchange any item within 30 Days of its purchase through our simple, hassle-free return process. Szul guarantees 60 days wear-and-tear repairs for all its merchandise. We expedite all repairs and try to return your repaired merchandise within 7-10 business days. All orders are shipping in our “Szul Signature Packaging”. Most of our Fine Jewelry is shipped in a Velvet Jewelry box along with an outer cardboard box. These boxes are perfect for Gift Giving at the same time great for storing your Jewelry. Our promotional Jewelry is mostly shipped in a lighter cardboard Jewelry box or a Velvet Pouch. e respect the value of all personal information that you share with us. We appreciate the fact that you are showing us your trust and confidence, and we promise to live up to your expectations at all times. We will use your personal information only to improve your shopping experience on the site, and we will not share your information with any outside parties. Click here to view our complete Privacy Statement. Site Experience is good but product quality is bad. I found a similar item with good quality and less price in other stores. Wanted to reply to another review "No customer service. No one picks up the call. The jewelry is made cheaply. I want to return, but there is no customer service call". Same here but my experience is to contact them via email. All products that were bought for me as a gifts are nice and also great prices with their sales. The site very easy to use. Happy with my necklace purchase! Horrible quality. 50 cent pendant available on ebay , sold on szul for 50 dollars!!!! In the jewelry industry, the word "cut" usually brings to mind the shape or the outline of a diamond's front. The seven most popular and fashionable shapes are the round brilliant, marquise, pear, emerald, oval, princess, and heart. Round Brilliant -- The modern classic for cut diamonds. 58 facets offer great brilliance and stability. This shape is most common and most popular for solitaire pieces. Marquise -- Currently a very popular shape for engagement rings. The brilliant style marquise, with its distinctive pointed oval form, carries the name of a French noblewoman. The pointed ends make this shape the most fragile and the most expensive of brilliant style cuts. Pear -- Less expensive than the marquise, but just as distinguished looking. Cut to maximize brilliance like the round brilliant, the pear shape has one pointed end -- and so, it has the same issue of fragility as the marquise. Oval -- If you are looking for a unique alternative to the round brilliant, the oval may be just what you want. It has excellent light dispersal like the round, but its shape may make it look larger than a round diamond of the same weight and quality. Emerald -- So named because it is the shape most associated with emerald gemstones, this is the most expensive shape for cut diamonds. Fewer facets distract the eye from any inclusions, so the emerald cut diamond generally has higher clarity. But, with fewer facets comes less brilliance than the other shapes. And, the emerald cut can look dull quickly, especially if you tend to wash your hands and put lotion on while wearing your jewelry. Princess -- Remarkably lovely and eye catching, this diamond shape is very popular right now, especially in "invisible" settings. Better yet, its sparkle won't dull as quickly as the emerald cut. Heart -- A very special and romantic shape. The heart shape diamond is difficult to make perfectly proportioned, but its not hard to love. This shape is full of fire and brilliance like the round and the marquise. Baguette -- These small, rectangular diamonds are cut to maximize brilliance like the shapes described above. But, their major duty is to fill in channels, or stable grooved tracks, around a gemstone centerpiece. Jewelry designers sometimes only use baguettes to create dramatic contemporary looks for rings and pendants. Deep in the earth, when a diamond was being formed out of carbon, certain chemicals may have been drawn into the mix. The result is an added tinge of color in the transparent stone. Most common in diamonds is a degree of brown or yellow color, but diamonds have been found in all the colors of the rainbow. When jewelers talk about the "fine color" of a diamond, what they really want you to notice is how little visible color the stone has. Colorless, or icy white, diamonds are the most prized and most expensive. The slightly colored diamonds are less valuable than the perfectly white or boldly colored red, yellow, and blue "fancies." The 45.52 carat Hope Diamond, on display at the Smithsonian, is remarkable in part for its prized cornflower blue color. Diamonds are graded according to the GIA color chart. Private companies once used their own grading systems and called diamond colors AA+, AB, 1+, etc. The GIA (Gemological Institute of America) - an independent, non-commercial association - wanted to create a standard chart that couldn't be compared or confused with others. Thus, the perfectly colorless diamond is now given a color rating of D. Any company that tries to sell you a diamond they rate as "A+" in color is probably up to no good. Diamonds are measured in terms of weight, not size. The heavier the diamond, the greater the carat weight. The name "carat" is derived from the carob seed. These seeds are remarkably consistent in weight and size and so were the favored scale balances in ancient markets. Carat weight should not be confused with "karat," the term used to describe gold's fineness or purity. A gem carat equals 200 milligrams, and there are 142 carats to every ounce. A carat is composed of one hundred points. Jewelers evaluate a diamond's carat weight by using an exceptionally sensitive metric scale that measures weight in points. So, a 1/4 carat diamond is also called a 25 point diamond. Because large diamonds are extremely rare -- and diamonds over one carat in size are becoming increasingly so -- every tiny increase in weight can result in a big increase in market value. Generally speaking, the larger the diamond, the higher the price. Even a large diamond that has so-so color and clarity will cost more than a smaller but finer diamond, simply because the larger ones are scarce. Clarity is the term used to describe a diamond's clearness or purity. Taken into consideration are the number, size, nature, and location of imperfections on the finished gemstone. Internal flaws are called inclusions, and external ones are called blemishes. Many of these are not visible to the naked eye, but under magnification, tiny featherlike shapes, crystals, bubbles, and dark flecks become apparent. These marks are as distinctive and recognizable as fingerprints -- in fact, they are commonly referred to as the diamond's fingerprint. The more imperfections there are in a diamond and the more visible they are to the eye, the lower the market value. IF Internally Flawless clarity diamonds have no visible inclusions even under extreme magnification and contain extremely minor surface marks. IF diamonds are very rare and are considered very valuable. VVS1 Very Very Slight Inclusion #1 VVSI clarity diamonds have very tiny inclusions and are extremely difficult to find, even under extreme magnification. VVSI diamonds are very rare are considered very valuable. VVS2 Very Very Slight Inclusion #2 VVS2 clarity diamonds have very few and very tiny inclusions. Inclusions are impossible to locate with the naked eye and are also extremely difficult to locate under 10x magnification. VVS2 diamonds are very clean stones and considered top of the line. VS1 Very Slight Inclusion #1 VSI clarity diamonds have a very few, difficult to see inclusions. The minor inclusions are very difficult to see under 10x magnification and close to invisible to the naked eye. VS1 diamonds present a very good value opportunity because they are considered extremely clean stones and are considerably less expensive than the higher clarity grades. VS2 Very Slight Inclusion #2 VS2 clarity diamonds have a very few small inclusions which are difficult to see under 10x magnification and would be extremely difficult to locate with the unaided eye. VS2 diamonds present a great value opportunity because they are considered very clean stones and are priced much lower than higher clarity grades. SI1 Slight Inclusion #1 SI1 clarity stones contain a few inclusions which are usually visible under 10x magnification. To the naked eye, inclusions are difficult to see and are considered very good stones. SI1 stones are less rare than higher clarity grades and thus offer a very good value. SI2 Slight Inclusion #2 SI2 clarity diamonds contain inclusions which are easy to see under 10x magnification. To the naked eye, inclusions are still difficult to see but if studied extremely closely, they may be slightly visible. SI2 stones offer a very good value and are considered very good stones. I1 Included #1 I1 clarity stones contain inclusions that are rather obvious under 10x magnification. To the naked eye, minor inclusions can be seen but they do not detract from the stones overall natural sparkle and fire. I2 Included #2 I2 clarity stones contain inclusions that are obvious under 10x magnification and can usually be located by the unaided eye. Once an I2 clarity stone is set in jewelry, it becomes more difficult to see, but if studied closely inclusions may be visible. Eye Clean Eye Clean Eye clean stones do not consist of an exact clarity standard. They fall in the approximate range of I1-I3 stones. The diamonds are hand picked and any inclusions are not immediately visible to the naked eye. Under 10X magnification impurities and inclusions can be located. Eye-Clean stones present a tremendous value. The overall brilliance and sparkle is not hindered by the inclusions and all stones are inspected to ensure an overall brilliant look. All gemstones used are hand selected and matched from a selection of gemstones considered AA+ rated. Unlike diamonds, there is not an industry standard grading system. AA+ gemstones consist of stones that have consistent color, excellent finish and shine, and no surface scratches. Any minor internal inclusions are only visible under 20X magnification or more. If you would like more information on gemstone quality or would like to request an upgrade or customize your purchase, please contact our Customer Service Department at 800.332.4382 and ask to speak with a Diamond and Gem Specialist. *Please Note: natural precious emerald gemstones tend to have more visible inclusions even when considered to be of AA+ quality. AA+ emeralds tend to have slightly cloudy areas and/or minor black inclusions deep within the stone. The look is very appropriate for high end and everyday wear jewelry. Our gemologist hand select emeralds to maximize a balance in color clarity. Depth measures the height of the diamond from the Culet to the Table. Depth measurement is quoted in millimeters. Table refers to the largest facet on the diamond located on the top of the stone. The cutting process of a diamond includes a polishing procedure in which a final finishing is applied to each facet of the stone. Faint polishing lines, which are invisible to the naked eye, result from the process. The polish grading is an indicator of the cut quality. Polish range includes Ideal, Excellent, Very Good, Good, Fair and Poor. Diamond Symmetry refers to the cut proportions of the stone's facets. Symmetry quality is based on the likeness of the stones upper and lower cut proportions. The higher the grade, the more alike the cut facets between the Pavilion and the Crown will be. . The symmetry grade is an indicator of the cut quality. Symmetry range includes Ideal, Excellent, Very Good, Good, Fair and Poor. The Girdle of a diamond describes the narrow band between the Crown and the Pavilion. Girdle is described in terms of the amount of thickness the area includes. Girdle range includes Extremely Thin, Thin, Medium, Slightly Thick, Thick, and Extremely Thick. The Culet refers to a tiny flat facet at the bottom of a diamonds Pavilion. Flat culets were used in the olden days to offer protection to the stone and prevent chipping on the bottom side. Modern cuts usually have a small to no culet because settings usually provide sufficient protection. Fluorescence describes a level of light emission when exposed to UV Rays. Fluorescence can usually only be detected by an experienced gemologist. Strong and Very Strong Fluorescence tend to create for a slight cloudiness to the stone. High fluorescence is rare and lead to a slightly lower priced stone. The Szul Price Advantage - How do we do it? Szul not only manufactures the majority of the jewelry listed on the site, we also work very hard to source our loose diamond and gemstones from specialized markets around the world. Doing this helps us eliminate most if not all of the middleman markups seen with most retail competitors. When it comes to diamonds, we are the best at what we do. While we offer several different qualities of diamonds, you will notice a lot of our stones grade with I1-I3 clarity and H-J color grading. We firmly believe that having diamond jewelry with large carat weights should not be out of reach for the budget minded shopper. While some of our stones may technically not be the best quality rating one can buy, we work hard to source material that has a very high color, no major visible inclusions, and has a fiery brilliance. This combination makes for a great piece of jewelry that unless inspected under magnification or by a trained eye, gives off a brilliant sparkle. Customers who are looking for large ½ carat and 1 carat center diamonds can get a stone with great sparkle and no visible flaws at an exceptional price. These stones are a great value but are difficult to find so most retailers cannot continually supply them…but this is our specialty and we are able to buy them in bulk and extend the savings to you. Gemstone jewelry, especially gemstone and diamond jewelry set in sterling silver is often marked up at multiple times the cost. Not only do we manufacture our items in bulk, we also have minimal markups so the pieces affordable. You are essentially buying your jewelry directly from a factory. The quality of our semi-precious gemstones are of the highest quality and consist of deeply colored stones with flawless clarity. Our precious stones are also considered on the upper end of the scale. While there is a quality grade higher available with precious stones (ruby, emerald, and sapphire), we feel the AA+ graded stones we use are very appropriate for everyday wear jewelry and consist of a deeply saturated colored stone with no surface inclusions that look great and flawless when worn. We stand by the material and value used on all of our products and offer a full money back guarantee on all purchases. When buying larger diamond pieces we are always happy to work with our customers to exchange or upgrade stones in case they are not fully satisfied. Our goal is to provide our customers with a value and price that simply can’t be beat and we are determined to earn your satisfaction. If you have any questions about our products or any policies, please feel free to contact our customer service department and we will be more than happy to assist you. Thank you for telling a friend about Szul.com. Most rings can be easily resized by any local jeweler or by calling our customer service department and requesting a custom ring size. Please email us at customerservice@szul.com or telephone us at 800-332-4382 and a representative will gladly coordinate a customized ring size. Because most of the items listed on the Szul.com website are items we manufacture, we can usually honor customization request. If you are looking for the same item but would like it in a different metal type, stone type or carat weight, we would be more than happy to research your request and let you know availability and pricing. Please email us with the Product ID of the item you would like to customize along with details of your request. Please email us at customerservice@szul.com or call us toll free at 1.800.332.4382 to speak with a product specialist. This item comes with a hand-picked center diamond of exceptional value. The stone rates with an I-J color and I2-I3 clarity. While there are no glaring imperfections which are easily noticed by the naked eye, there are imperfections in the stone that are reflected in the overall brilliance. These stones present a tremendous value and overall offer a nice white color, good brilliance and a big diamond look. 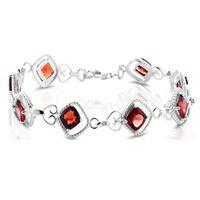 These stones are hard to find and are usually priced much higher with local jewelers. If you would like to upgrade the center diamond to one of higher quality, we offer an excellent upgrade option which also presents an exceptional value. The upgrade option available will be a grade higher in both color and clarity. The stone overall will have a better brilliance, cut and clarity. Please feel free to contact our Customer Service Department and a Diamond Specialist will be more than happy to discuss and answer any additional questions. When selecting an IGI Upgrade, not only will you be purchasing a higher quality diamond, your order will also come with a grading report from the International Gemological Institute (IGI). IGI is an independent laboratory which is a trusted name for expert and impartial certification of fine diamond jewelry. Your item will come with a report detailing the authenticity, metal verification, carat weight as well as minimum quality grades of all diamonds used on the item. Your item will have a custom card with an image of your jewelry piece. IGI stands behind its grading practices and customers should feel confident that it will stand up to any 3rd party appraisal process. You can get more information by visiting www.igiworldwide.com. The color rating is based on a minimum color grade when compared to a GIA color standards chart. All diamonds are hand selected and feature an overall white color without any noticeable tint of color. The diamonds present a great value and if you are not satisfied with the stone quality, in addition to our return policy, we are always committed to working with customers to replace and/or upgrade diamonds to meet your satisfaction. The clarity rating is based on a minimum clarity grade when compared to a GIA clarity standards chart. All diamonds are hand selected and feature stones without any major naked-eye visible inclusions. Receive an email when this arrives in stock. Thank You. We'll notify you when this product arrives in stock. Sign-up for special offers. We don't spam and won't sell your data. spam and won't sell your data. Copyright © 1999 - 2019. Szul. All rights reserved.